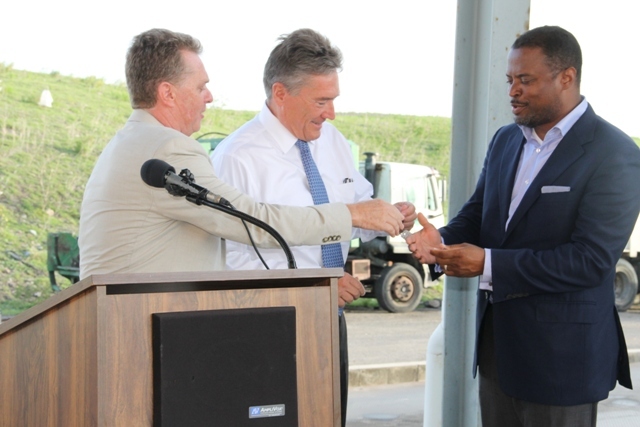 NIA CHARLESTOWN NEVIS (September 21, 2015) — The Nevis Solid Waste Management Authority received keys to two state-of-the-art fully-automated garbage collection trucks, from Omni Global, the parent company of Omni Alpha, at a handing over ceremony at the authority’s Long Point facility on September 17, 2015. The 2016 Kenworth rear end loading trucks, valued at US $300,000, are part of an agreement made between the Nevis Island Administration (NIA) and US-based Omni Global in 2014, to construct a waste-to-energy plant and solar farm on Nevis in the latter part of 2015. In his remarks, Deputy Premier and Minister of Health Hon. Mark. 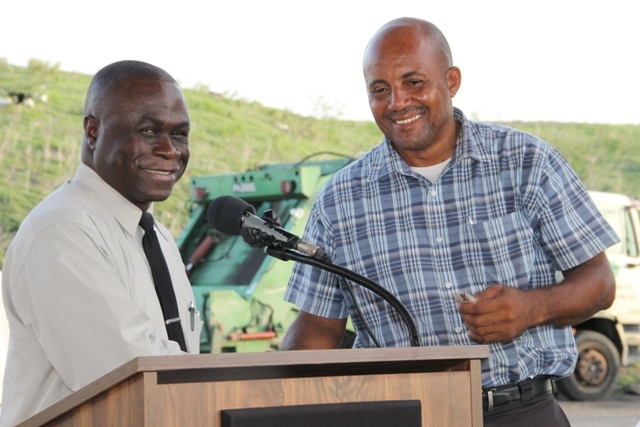 Brantley said the new waste collection trucks represent a significant achievement and milestone, as the NIA continues to ensure that the people of Nevis are provided with the necessary tools to live successful and comfortable lives. 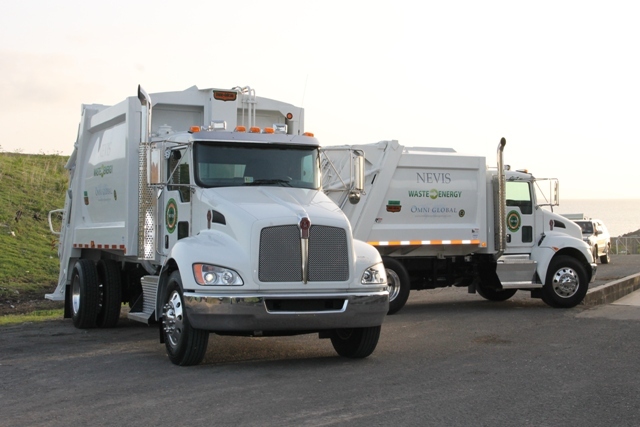 He said the investment is the largest in waste collection on Nevis in recent years and called on the workers at the authority to care for the trucks which he referred to as a significant investment in the future of Nevis. According to Mr. Brantley, the delivery of the new trucks from Omni Global was just the start and the NIA has already assigned some acreage of lands along the Long Port road for the waste-to-energy and solar plants. “I am reliably advised that the solar plant is going to start very soon and so we would expect not only to see the trucks now traversing the roads of Nevis and picking up the trash from all of us but also to see in very short order, that the plant itself is going to start. The solar aspect of it, I gather, is the first phase and then the waste-to-energy,” he said. 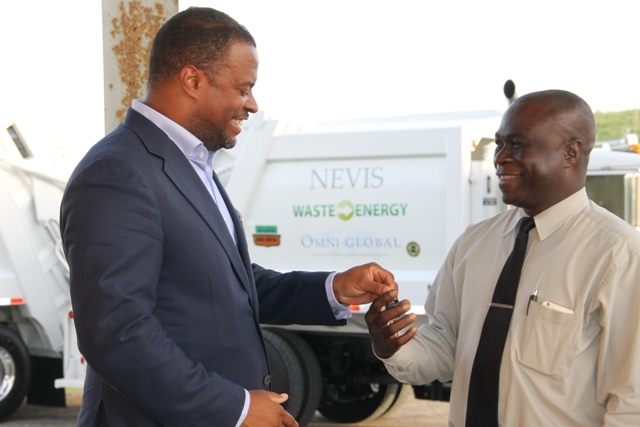 The Deputy Premier used the occasion to urge Nevisians to see the waste-to-energy agreement as not just a mechanism to generate electricity, though it is a component of the project but instead, to see it as providing the island of Nevis with a waste management solution. He said the most troubling waste products on the island are tyres and plastic material and he has been advised by experts that both are the highest value waste products for gasification and for purposes of generating energy. Mr. Brantley noted that discarded tyres are already being collected and stock piled at the landfill for use in the waste-to-energy plant, which would also allow for additional supplies of renewable energy without burning fossil fuels. “It allows us a waste management solution to allow you, when you throw out your bottles and everything else that you throw out, the trucks pick them up and then the waste-to-energy plant disposes of them and transforms them into something and I am told, this can be done at minimal, if any impact, on our natural environment and so for me it’s a win-win-win situation,” he said. Mr. Brantley thanked David Johnson, Omni Global representative and a resident on Nevis, for his confidence in the administration so early in its term. He also thanked his cabinet colleagues for their wisdom to support the idea and the entire Omni Global team for coming to the table and negotiating in good faith. Also present at the handing over ceremony were Junior Minister Hazel Brandy-Williams, Legal Advisor Colin Tyrell, Chairman of the Nevis Solid Waste Management Authority Carlisle Pemberton and Board Member Nigel Powell, Omni Global’s Caribbean Region Operation Manager Steve Hammond, Omni Global Representative David Johnson and staff of the Nevis Solid Waste Management Authority.